Early in June 40,000 Rotarians converged on Atlanta, Georgia for the annual Rotary International (RI) Convention to celebrate and introduce the new leadership for RI zones, regions and districts worldwide. Onsite and digital networking introduced over 1.2 million members to current hot topics: world peace, the scourge of human trafficking, and a celebration noting polio impending eradication. Encompassing China Lake to Westlake to Cambria, District 5240 has 74 clubs with 3,285 members. Approximately 170 members explored the Atlanta Zoo welcoming its newest District Governor (DG), Morro Bay’s John Weiss. 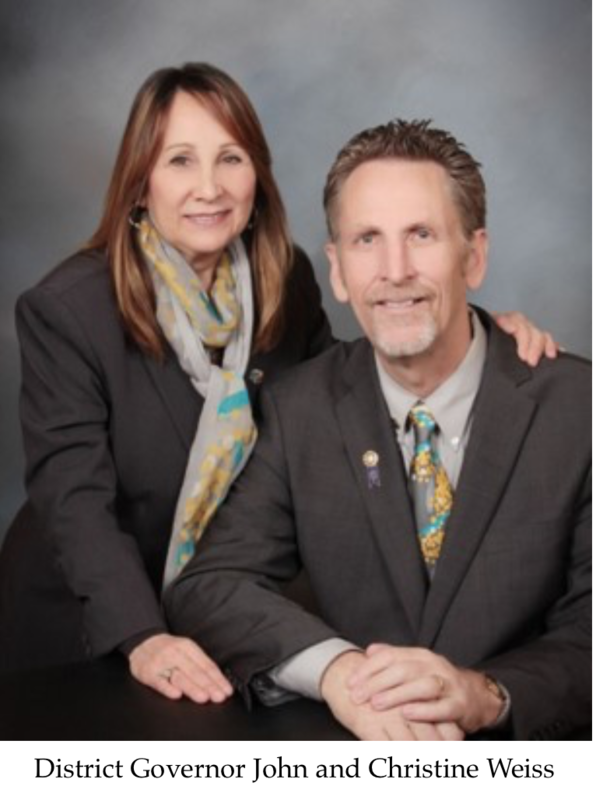 San Luis Obispo County Rotary Clubs have produced at least seven DGs: Brenda Cressey, Paso Robles (2001-02), Frank Ortiz, Santa Maria (2012-13), Loretta Butts, Atascadero (2014-15) and from Morro Bay: Mac Little (1978-79), Walt Milburn (1983-84), who proudly promoted voting to bring women into Rotary his year, and Chungsam Doh (1998-99), a transferred member to Morro Bay from Bakersfield by way of South Korea. A three-year training program prepares DG’s to provide leadership, motivation, and guidance to Rotary clubs under the general supervision of the RI Board of Directors, but first they’re trained to serve as club presidents before consideration to serve at the district level. Weiss was club president in Morro Bay 2009-10. A few highlights of his year were creating the ongoing Public Heroes program recognizing non-Rotarians serving Morro Bay, reinvigorating a golf tournament to include high school golfers, establishing Eco Rotary Clubs in Morro Bay and Pismo, and chartering a college Rotaract and a high school Interact club. His focus on youth and membership services was noticed by District Governor Deepa Wellingham, who invited him to serve on her team in 2010-11. Based on a record of service, a district governor candidate must be invited. Campaigning will disqualify a nominee. After serving at the club level, then four years at the district level, Weiss was nominated by Morro Bay Rotarian Jeff Jones. He was interviewed by a panel of twelve, RI’s parliamentarian and two past DGs. Once selected training intensified. Weiss explained 535 global DG nominees convened at an International Assembly in San Diego. “It was five days nine to five and they take roll daily.” He has also participated in district training sessions for the 74 club president nominees for the past two years. His team plans the training meetings for 2017-18. The good news is a DG selects a staff of 50 to help plan, executive and support district activities. Weiss’ SLO team members include Deb Linden, Michael Boyer, Connie Henley, Jeanne Potter, Mike Pond, and Melinda Thomas. “Assessing the president nominees, it was huge that 75% wanted to focus our year on Youth Services, which has been my passion for two years.” The better news is “My staff is amazing.” Their goals include networking millennials and baby-boomers to refine ideas and future action plans. In 1997 Doug and Diane Pankey were first time visitors to the annual 4th of July celebration in Cayucos. She had no idea Doug had planned something she would remember for a lifetime. They had only been a couple for six months, but their January first date proved they had much in common. And while busy in their San Joaquin Valley careers – she a polymer chemist and he a flooring contractor — Doug knew he was thinking marriage to Diane. The community agreed as thousands and thousands meet in the California Beach town on the Pacific Highway 1 coastline to make their family memories during the Cayucos 4th Celebration. For 2018 details check out the Cayucos Lions Club www.e-clubhouse.org, Cayucos Lioness Club, http://www.cayucos lioness.org, and the Cayucos Chamber of Commerce www.cayucoschamber.com.